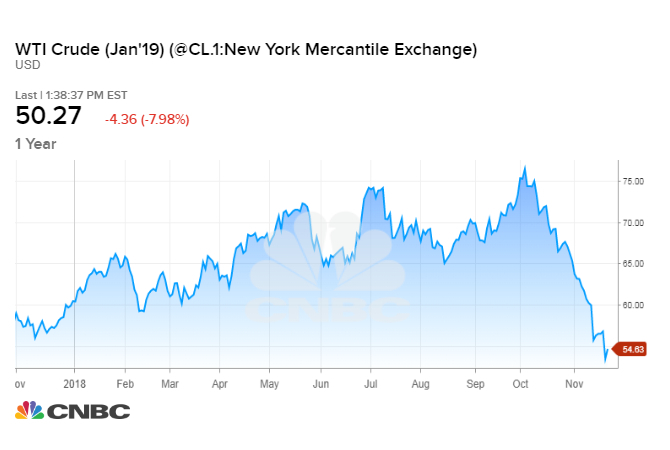 Oil prices fell on Friday to their lowest levels in more than a year, deepening a rapid seven-week sell-off that has plunged crude futures deep into a bear market. So far, the prospect of the Middle East-dominated group orchestrating a fresh round of supply cuts has done little to prop up crude futures. WTI has now lost 34 percent of its value from its peak on Oct. 3 to the trough on Friday. Brent has fallen as much as 32 percent. "I have to say that the speed in which the oil market has declined has surprised me even as OPEC and non-OPEC members discuss a production cut," said Andrew Lipow, president of Lipow Oil Associates. "The market does not think it will be enough." The latest wave of energy market selling comes amid escalating concerns about an increase in global supply and a slowdown in economic growth. Saudi Energy Minister Khalid al Falih on Thursday said the kingdom's output this month would surpass October's production of 10.6 million barrels per day. That is near an all-time high but below the 10.7 million bpd guidance for October that Falih announced last month. Falih also said in October that November output would hit 11 million bpd. Sources told Bloomberg News this week the Saudis are currently pumping a record 10.8 million to 10.9 million bpd. Falih on Thursday said demand will be lower in January and the kingdom will respond to weaker consumption. The minister has already warned Saudi oil shipments will fall by 500,000 bpd in December. Falih pinned the anticipated drop in demand on the Trump administration allowing some of Iran's biggest customers to continue buying that nation's crude despite U.S. sanctions on the Islamic Republic. Saudi Arabia and other producers increased output earlier this year in anticipation of the sanctions renewal, but the waivers mean fewer Iranian barrels came off the market than expected. Meanwhile, U.S. crude production has reached 11.7 million bpd, according to preliminary weekly figures. Russia has also been producing at post-Soviet-era highs above 11 million bpd in recent months. The downtrend in oil prices has most definitely taken "some by surprise," Tamas Varga, senior analyst at PVM Oil Associates, said in a research note published Friday. "The question is … How much longer (are) bears are able to keep firing?" Varga wrote. Global oil supply has surged in 2018, with the International Energy Agency recently predicting non-OPEC output alone would climb by 2.3 million bpd this year. That is an increase of half a million bpd from the group's forecast six months ago. Meanwhile, the IEA expects demand in 2019 to grow at a rate of 1.3 million bpd, down slightly from a forecast of 1.5 million bpd six months ago. Analysts at Morgan Stanley believe there are "compelling arguments" on either side when it comes to the OPEC alliance considering whether to implement production cuts from Dec. 6. However, on balance, analysts at the firm said in a research note published Friday that the chance of supply cuts were around "2-in-3." "In that scenario, Brent prices likely recover back into the $70s … On the other hand, in the 1-in-3 probability that OPEC does not come to an agreement, there is still downside to Brent prices, although probably not much below the high-$50s in the next few months." Supply cuts also put the OPEC and non-OPEC alliance on a potential collision course with the United States. President Donald Trump is publicly in favor of low fuel prices and has urged the group not to reduce crude production next month. A day after standing by Crown Prince Mohammed bin Salman in the face of allegations that he had ordered the killing of dissident journalist Jamal Khashoggi, Trump on Wednesday publicly thanked Riyadh for helping to keep a lid on oil prices. But Trump also called on the de facto leader of OPEC to push prices even lower over the coming months. About two dozen exporting nations began capping their output in 2017 in a bid to drain a global crude glut. The group relaxed this strategy in June, but in September, some of the world's leading oil producers were talking about pumping extra oil onto the market in order to help soothe intensifying supply shock fears.